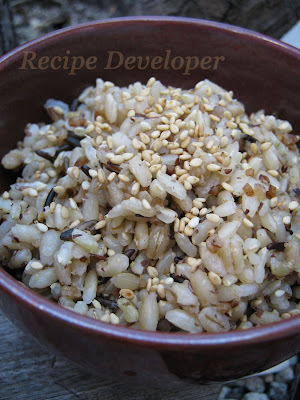 As I wrote the other day, I now started to create a few dishes with SOBA-CHA(Roasted Buckwheat Grain). Today, I will show you some of rice dishes I have made. This one is a mix of short grain brown and white rice, oats, wild rice, pearl barley, flaxseed meal, and SOBA-CHA(Roasted Buckwheat Grain). 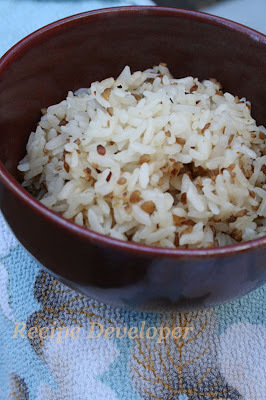 This gave it a little crunchy texture, and everytime you bite it the grains you can taste the sweetness of grains which combined together made a tasty complexed flavor. This dish I added some ingredients with Rice and SOBA-CHA when I cooked the rice in the rice cooker. 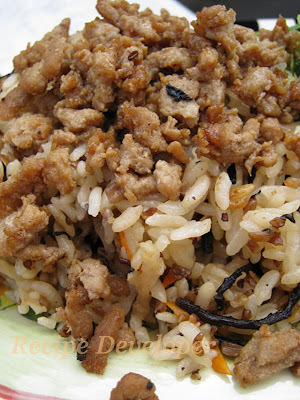 Carrot, Dried Daikon(kiriboshi-daikon), Dried Seaweed(hijiki), Shiitake-mushroom are added with little soy sauce and salt, along with some lightly seasoned ground turkey on the top of the rice.